Meet Bhoorsingh the Barasingha- the official mascot for Kanha National Park (Madhya Pradesh, India)! Bhoorsingh is proud of two things- of being endemic to Kanha, and of his twelve-tined antlers! I visited Kanha last month over another project and met the dynamic Field Director of the park, Mr. Sanjay Shukla. A real visionary that he is, Mr. Shukla was full of creative ideas about creating awareness material for Kanha, and conversations with him led us to choose the Barasingha, an endemic variety of deer, as the park's mascot. 'Bhoor' in Hindi translates to 'tawny/golden' and 'Singh', 'antlers'. Bhoorsingh will soon be featuring in more artwork, posters and merchandise for the park management at Kanha. The Kanha Bird Survey being conducted by the forest department and Bird Count India, begins today (17th to 20th March, 2017). And of course, Bhoorsingh is the brand ambassador for the event! More posters and artwork with our twelve-tined friend coming right up. Stay 'tined' for more! 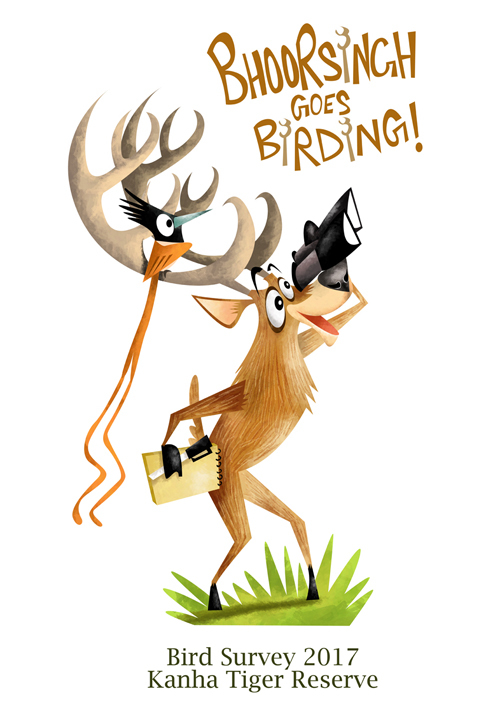 Some more illustrations done for Bhoorsingh 'selfie stands' that will be put up at tourist halt spots in Kanha.